For decades, cinemas have become our go-to source of entertainment; a way to immerse ourselves in the reality distortion field, follow our favourite actors/actresses and have a great time with our loved ones. They have provided us with hours of adrenaline, romance, comedy, even horror. Now it’s time to transform your big-screen experience, for the better. Introducing bespoke home cinemas and media rooms; the ultimate and most sophisticated way to experience high end audio visual entertainment, on demand and right in the comfort of your living room. Our Home cinema and media rooms offer the ultimate entertainment at home to enjoy with your family and friends. Custom designed rooms and systems provide you with the perfect multimedia experiences from any source, on any screen type. 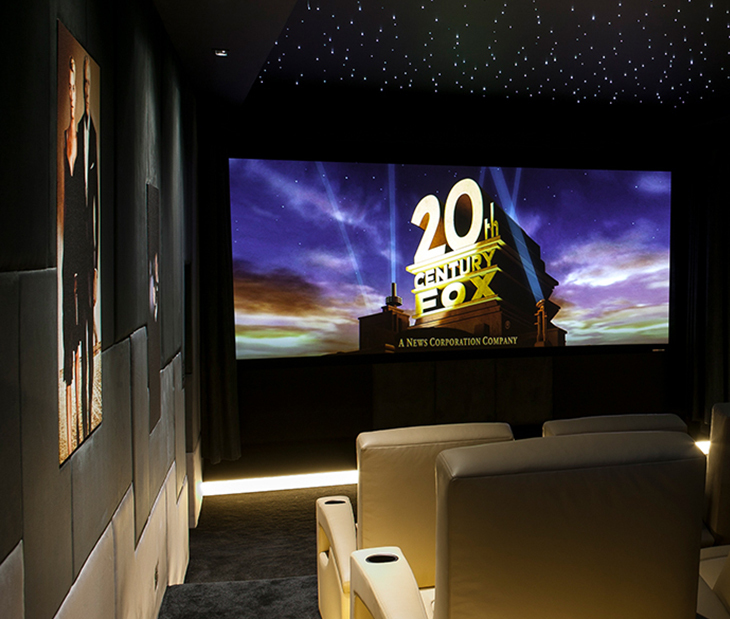 As home cinema installation experts, we reflect upon our 15+ years of experience to design and install exquisite bespoke home cinema systems that stand the test of time. We specialise in transforming any room in your house into perfect venues for watching films & TV shows, playing games and enjoying surround sound. Finite Solutions utilise the latest technology that has been tested and proven in house in our installations. We delivery systems that utilise technology that performs and delivers on expectations, from the latest 4k UHD laser projectors and OLED 4k TV screens to Storm and Arcam Dolby Atmos processing and B&W, Wisdom and Meridian speaker systems for exceptional performance and value for money. All our projects are calibrated to exacting standards by our in house staff to deliver optimum audio and video performance. In a true home cinema experience, lighting is essential to complement the atmosphere and to completely immerse yourself in the scenery. This is exactly why Finite Solutions offers bespoke mood lighting solutions. By combining soft and discreet lighting features, we can transform your entertainment, regardless of whether you are watching TV, playing console games or settling down with a movie. Create the right scene just with the touch of a button. As you settle down for the evening to kick back with a Blu-ray film, the last thing you want will be discomfort. Finite Solutions offer a wide variety of high quality customisable seating to suit your rooms style and layout. Regardless of your home cinema seating requirements or room dimensions, we can provide options that will deliver the comfort, style and robustness you require. Finite Solutions work either alongside your existing architect, designer and contractors to provide designs and audio visual installation services or we provide complete turn key solutions. Our turn key solutions will deliver the entire rooms interior, lighting and acoustic design followed all building and fit out works to create a bespoke room that is the ideal environment to deliver a perfect cinematic experience. To ensure your system is quick and simple for the whole family to use Finite Solutions provide smart remote controls or apps for your phone and tablets which provide single touch operation of the rooms audio visual systems, lighting, shading and heating. All equipment is hidden from site in custom built equipment racks so it doesn’t distract from the rooms bespoke interior. Want a high end entertainment system but unsure about the available space in your home? 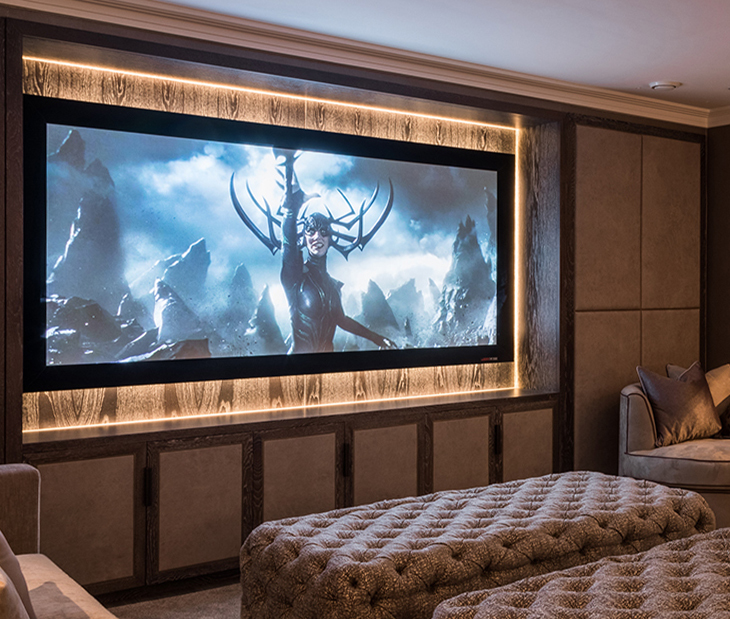 Modular and bespoke design and installation of home cinema systems ensure that a cinema system can be tailored to your needs, room type and room size. 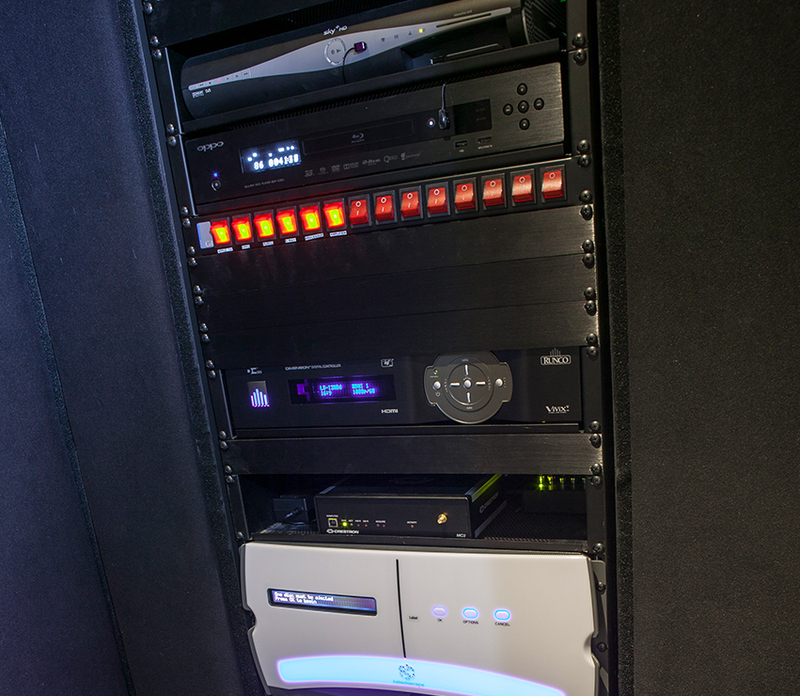 Regardless of whether it’s a living room, a small basement room or a large multi-purpose attic room, it is possible to achieve the perfect audio visual experience through intelligent choice, engineering and installation of home cinema components. Our turnkey solutions provide you with the ultimate comfort and ease of mind. We can cooperate with your preferred interior designer or manage different aspects of the project to provide a smooth customer experience that leaves you satisfied. Discover the different room types we most frequently install a home cinema system in. We take pride in the tremendous creativity, quality and functionality we provide with our home cinema and media room installations. Many of our projects have been recognised for awards by the industries leading trade bodies. Our tailored solutions offer you a wide range of options to choose from. With customisable seating, lighting, sound and AV options; you will get exactly what you want. Unlike other AV companies, we offer complete home cinema solutions from scratch, thanks to the extensive portfolio of professionals we work with. Let us worry about logistics, you enjoy your home cinema system. Finite Solutions offers the most extensive service options to cover any problems with your system before, during and after installation from our UK-wide offices in London, Leeds and Cheshire.